Great that such an authority in the area has taken the time, along with his team, to address real patient questions in such detail. Join the new Hip Resurfacing Site Patient message board! Most of the questions below came from patients and Vicky, and were submitted to Derek McMinn to address a large audience of Orthopedic surgeons who had a lot of questions they wanted answered too. The data does seem to suggest that the DePuy ASR was a very poor imitation of the BHR originally developed by Mr McMinn. But I KNOW I am going to get some incisive comments from my friend Howard Sadwin who has suffered greatly following the removal of a failed Smith & Nephew BHR. Howard fought for his life and spent 9 months in hospital and currently is wheel-chair bound with no hip. So he will be scrutinizing this article very closely. I have recently introduced Howard to Vicky via email and now phone – so Vicky and Howard will be chatting long and hard about the merits and demerits of the BHR as one example of a metal on metal hip replacement. 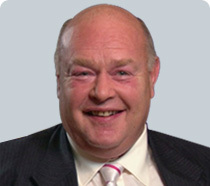 Mr. Derek McMinn, inventor of the BHR and eminent Bristish Orthopaedic surgeon. 1. Is there a specific test that is more accurate for metal level testing and what should a patient ask for when they go to their doctor to order the test? We use whole blood specimens drawn into lithium-heparin containing tubes with non-contamination precautions, and analysed with HRICPMS (high resolution inductively coupled mass spectrometry) for the most accurate assessment of metal ion levels. The problem with using serum, plasma or erythrocytes is that metal ions are differentially distributed in the intracellular and extracellular compartments and introduces variability. 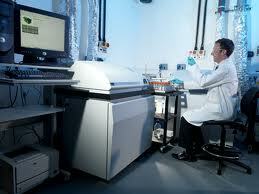 Furthermore the specimen must be centrifuged and separated locally soon after the blood sample is drawn. Delay in achieving this will hemolyze the specimen and can lead to significant errors in assessment. Other instrumentations are also used for analysis. Atomic absorption spectrometry and Quadrupole ICPMS are used but they are not as sensitive or reliable as HRICPMS and can also lead to erroneous values and misinterpretations. 2. If a patient has an ASR device, should the implant be replaced whether the metal ions are high or not? Since the ASR resurfacing has been shown to have design problems which predispose it to high wear, patients with this device or other unproven devices must be monitored regularly for signs and symptoms of high wear. If there are symptoms of groin pain, swelling, worsening walking ability etc, then they must see their surgeon. If investigations show the presence of a debris related problem and metal ion levels are persistently elevated, the surgeon may decide that revision surgery has to be performed earlier rather than later. Soft tissue necrosis has been a particular problem with the ASR device. Earlier surgery is warranted with this device to prevent muscle necrosis and a suboptimal result from revision surgery. Other resurfacings which have been mal-positioned also require attention and monitoring. One good aspect about modern hip surgery is that if something goes wrong with a device these can (in most instances) be revised to a different device. However the problem is that each successive revision tends to be more extensive than the previous operation. Furthermore since the operation is performed through previously scarred tissue, and there is often a need for a degree of bony reconstruction and repair, revision surgery is often more challenging and is known to be associated with a higher rate of complications. Therefore replacing any artificial hip device should not be taken lightly and should be entered into only when absolutely necessary. 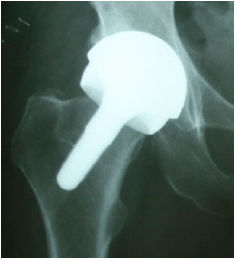 The judgment to revise an artificial hip device must always be a clinical decision. If a surgeon is faced with a situation where high wear is suspected either because the device is faulty or the device is improperly implanted, and the patient is showing persistently elevated metal ion levels, there is no merit in waiting for symptoms before revision. Under these circumstances early revision surgery is justified. A. Device flaws: Failure rates of up to 25 to 50% have been reported with ASR resurfacing and ASR XL hip replacements. These seem to occur even when the operations have been performed well by experienced surgeons. BHRs performed by the same surgeons did not show high failure rates even though the BHRs have been in place for a longer time than the ASRs. B. Surgeon errors: Component placement. A series of 4 different types of resurfacings from Oxford showed increased metal-debris related failures with all 4 types of resurfacings. When the components retrieved at revision were tested it was found that in every case with excess debris, the wear pattern suggested edge-loading. Edge-loading in a BHR is due to serious component malposition which is detrimental to any hip resurfacing or replacement. It is like running a car engine after draining out all the oil. The operations in that Centre had been performed in many cases by trainees. C. Patient factors: These metal-debris-related failures are seen more often in women than in men. One reason is that the size of components needed in women is smaller and therefore there is less margin of error in placement. Furthermore arthritis in young women is often caused by a condition called ‘Hip dysplasia’, where the socket of the hip is shallow and there are rotational anomalies of both ball and socket. This three dimensional abnormality sometimes forces the surgeon into component malposition. In addition perhaps women are pre-sensitised to metal due to the usage of costume jewellery etc and their tissues may over-react to low levels of nickel released from artificial devices. In a situation where high wear is suspected due to any of the factors above and the metal ion levels are persistently elevated revision surgery is required. The incidence of wear debris related revisions in several BHR series is around half of 1% at 10 years. In the McMinn Centre series it is 0.3%. In the presence of wear, the longer one waits before revision surgery the greater can be the adverse effects on the local tissues including bone, muscles and other soft tissue structures. Therefore there is no merit in waiting indefinitely for symptoms to appear before performing revision surgery. 3. If a patient’s metal levels are really high, after revision surgery do the metal levels go down and how long does it normally take before it returns to normal? What information do we have about how quickly cobalt and chrome are cleared from the body after the implant is removed? We have been following up the metal ion levels in a small group of patients with failed metal-on-metal bearings (resurfacings and replacements). We find that during the first two months there is a rapid decline in metal ion levels most of which occurs in the first week after revision. Subsequently there is a more gradual reduction over a period of two years when the metal ion levels reach baseline levels. 4. What levels are considered high and to be of concern for a patient to seek out treatment? On this website people report being told by their surgeons that they have “elevated levels of cobalt” ranging from single digit numbers (one person reported 9.2 for example) up to numbers as large as 2400+. There is a lot of confusion in this area because of the different measurement techniques and specimens used, and the units in which they are expressed. Different cut-off levels have been advocated by different authors varying from 2 to 25 parts per billion, ppb (34 to 424 nanomoles-per-litre, nmol/L) of cobalt, none of which is based on any valid test of systemic toxicity. Provided the correct specimen is used and analyzed by the correct method (ref to Q1), metal ion levels provide a reasonable measure of bearing wear. In most cases it can be said that a patient with high metal ion levels is more likely to have an adverse reaction than someone with regularly expected levels. The MHRA (medicines and healthcare products regulatory agency) the statutory body that regulates resurfacing devices in the UK advocates the figure of 119 nmol/L cobalt (or 7 parts per billion, ppb) for resurfacings. 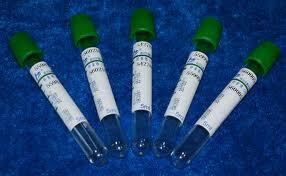 This was not arrived at, by performing the kind of pharmacokinetic tests that are carried out for drug toxicity. It was based on the distribution and variations of cobalt levels in patients with well-functioning metal-on-metal (MoM) resurfacing. Levels above this do not indicate systemic toxicity. They have used it more as a rough guide to identify potential cases for local debris related reactions only. It is suggested that it is reasonable to reassure patients with less than 7 ppb that they had a well functioning MOM hip and monitor those with greater than 7 ppb. It does not mean that this level causes systemic toxicity. It only implies that among patients who develop a local reaction the blood levels are often greater than 7 ppb. What are the effects of elevated cobalt and chrome? a. Which ones are normally displayed while the ion levels are high? b. Are there any residual effects that might be felt later in life from having a major episode of metallosis? (e.g. are they carcinogenic? Are there any long term effects of metal from metal implants such as cancer or immune system disorders or problems like pain in other areas of the body, rashes, etc., or any patients that have ended up with strange illnesses caused by metal implants? Or at least proven to be caused by metal implants, or is all the hype from the attorney sites just a scare tactic and the metals they are talking about different than what happens with metal implants inside the human body? There has been little study done into the long-term effects on patients’ general health of metallosis caused by cobalt- chrome hip implants. Whilst most studies focus on immediate damage around the joint, e.g., ALVAL, pseudo-tumors, etc., is anyone doing research into systemic effects of cobalt chromium metallosis? What are their initial findings?” Cobalt, chromium and molybdenum are the main constituents of the alloy used in MoM bearings. All of these are essential trace elements for humans and are found in the water supply and food. Measurable metal ion levels are present in the blood and urine of subjects with no artificial metal devices in the body. Cobalt is the only metallic element in vitamin B12 and is as critical to its function as iron is to haemoglobin. In the past cobalt used to be administered as a supplement for patients with anemia. Molybdenum is a cofactor in amino acid metabolism and in the detoxification of drugs and toxins. Chromium is essential for all the energy functions of the cell. It is part of the cellular structure that potentiates insulin. Chromium deficiency results in diabetes. In the tissues chromium exists in mainly two valencies, trivalent and hexavalent. MoM bearing wear is a low energy process and the chromium released during wear is believed to be the trivalent variety. This is also the form in which its cellular functions are carried out. Neither cancer nor other serious adverse effects have been reported with chromium (III). Hexavalent chromium (Cr IV) is released in the high energy reactions of the welding, tanning, chrome plating industry etc where high temperatures or caustic chemicals are used. High doses are believed to be a potential cancer risk but it is suggested that this is not released in MoM bearing wear. Cardiomyopathy has been attributed to excess cobalt in the 1960’s in the context of the Quebec Beer-Drinkers’ Disease. Brewers added cobalt to beer to improve its foaming quality. Some of those who consumed large quantities of this beer developed cardiomyopathy. The estimated doses of cobalt in these drinks are many times larger than the exposure risk from MM bearings. However, the cobalt doses in that alcohol were low in comparison to the therapeutic doses of cobalt used as a haematinic in the past and the haematinic use of cobalt has not been implicated as a source of heart disease. Thus it appears that a combination of cobalt and substantial amounts of alcohol were needed for the occurrence of cardiomyopathy. Very rare instances of systemic disturbances from cobalt toxicity have been reported with reference to artificial hip devices as well. However, of the six cases reported worldwide so far, only two were in patients with MoM hips (both ASR). 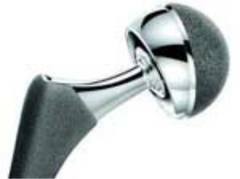 Four other published cases had hip replacements which did NOT use metal-on-metal bearings. Commenting on this, Dr. Joshua Jacobs from Chicago states that ‘this risk is not unique to metal-on-metal bearings… other metal devices with accelerated damage due to wear or corrosion can lead to elevated levels of metal in local and remote tissues.’ (ref http://jbjs.org/data/Journals/JBJS/181/e35.pdf). The metal ion levels reported in these ASR and non-MoM hip replacement patients were extremely high, and to our knowledge, have not been reported in BHRs. The prevalence of systemic disease in patients with MoM hip resurfacings and metal-on-polyethylene hip replacements has also been studied from the data in the large UK National Joint Register at 5-year follow-up. It showed that there was no difference between the prevalence of systemic disease in MoM resurfacings as compared to nonMoM hip replacements. It may be argued that 5 years is too short a period for adverse effects. Visuri from Finland reported a 30-year study involving 36592 person-years (more than 2000 patients with osteoarthritis who were followed up until death or emigration). 579 patients had metal-on-metal THAs and 1585 had metal-on-poly (MPE) THAs, providing exposure risk of over ten thousand person-years with the MoM hips and over twenty six thousand person-years with MPE hips. Patient records from the general population were used as controls. 528 of the MoM THAs and 1299 of the MPE THA patients had died. The reason for death was studied and compared with the general population. Life expectancy after either type of hip replacement (MoM or MPE) was better than the general population during the first postoperative decade, similar to that of the general population during the second decade, and was worse during the third. Total mortality did not differ significantly between the MoM and MPE groups across the postoperative decades. Their data can be tabulated as follows (Table 1). In another study Visuri also showed that at 30-year follow-up, metal on metal hip replacement patients showed no difference in cancer rate as compared to the general population. This is true for the incidence of cancers at all sites combined as a group and also for site-specific incidence of different cancers. The only incidence that shows a significant difference is that of lung cancer and that occurs less frequently in patients with MoM hip replacements as compared to the general population. Table 1. Comparison of patients with MoM and MPE total hip replacements and the general population over three decades. Extensive chromosome studies conducted at the Bristol Implant Research Centre in the UK showed that MoM hip replacements did NOT generate greater chromosome changes than either metal-on-polyethylene or ceramic total hip replacements. We performed a detailed assessment of the impact of metal ion elevation on the kidneys, on which we have published two papers. We found no detectable impact on renal function in patients with metal-on-metal resurfacings. We also assessed the impact of MoM resurfacings in patients who get pregnant after one-sided and two-sided resurfacings and hip replacements. We found that the placenta has a controlling and regulatory role in metal transfer to the baby and there were no reported anomalies in the babies. Campbell and colleagues from Los Angeles performed a post-mortem study on a cadaver with a MoM hip thirty years after implantation. They note that ‘there was no evidence of end-organ damage in any of the tissues that were examined in this case after nearly thirty years of exposure to metal particulates and ions’. In summary, we have not come across a single instance of a patient developing systemic adverse effects out of the 5000+ MoM hip resurfacings and replacements performed at our Centre over the last twenty years. Among the estimated one million modern MoM hip arthroplasty devices used in the past two decades only two cases of suspected systemic toxicity have been reported in the world literature. The expectation of patients who undergo hip resurfacing is to undergo the operation, and then progressively increase their activity in a sensible manner until they reach the point when they are carrying on with life as normal, having forgotten about their hips. If a BHR is used and it is implanted properly then that is indeed the outcome in most patients. 6. There is considerable discussion about the abduction angle of the acetabular component but not much discussion about the degree of anteversion. I have read that a retroverted socket will cause psoas impingement, but an anteverted one may lead to edge loading. Is the component orientation (angles) issue as critical relating to wear and metal ion production in the THR procedure as it is with BHR? Have those angles been determined for THR as they have with BHR? Do the surgeons see similar percentages of metal problems with both procedures or do they see more problems in one procedure than the other? You are absolutely right. Malposition of the cup in relation to the head in such a way that the wear patch approaches the edge of bearing surface leads to excessive wear. Cup abduction (or Inclination) is a two dimensional assessment. Malposition in the third dimension is represented by anteversion or retroversion. You are right in saying that excess anteversion leads to edge loading towards the front of the cup. Retroversion leads to psoas tendinitis and also anterior impingement (where the femoral neck hits against the edge of the cup in flexion). This leads to posterior subluxation of the head from the cup and to edge loading in the back portion of the cup. All of these are detrimental to long-term survival of the bearing. As a rule of thumb, provided there is no femoral abnormality, the surgeon should try to achieve around 40 degrees of cup abduction and 20 degrees of anteversion. Mr. McMinn has written in his book and teaches his surgeon colleagues regularly how this problem is particularly complex in young women who have hip dysplasia, because the cup will have to be dialed in to adjust for the femoral abnormalities which abound in dysplasia. In these women the femoral neck is often more vertical which means the cup will have to be implanted in an even lower abduction. Furthermore in dysplasia the femur is anteverted more than the average femur. This will need to be taken into account and the cup placed in reduced anteversion. If the femoral anteversion is too high (i.e. greater than 45 degrees) then resurfacing is not advisable. Implantation angles are as critical in hip replacement as in hip resurfacing. In view of the narrower hip replacement stem, there is marginally greater elbow room before impingement occurs but edge loading is as critical to hip replacement as it is with hip resurfacing. 7. Is there any reason Cobalt in the blood would not have the same effect as Cobalt inhaled? Adverse effects are more likely to occur in those systems which are at highest risk of exposure to the metal in question. Cobalt inhalation occurs in hard metal industry where cobalt is processed. The American Conference of Industrial Hygienists (ACGIH) states that among these workers, the effects seen in cobalt exposure are related to pulmonary (lung) and circulatory problems. Chromium exposure occurs in the steel, welding and tanning industries. The effects of chromium (III) are irritation and dermatitis and chromium (VI) are related to lungs in particular. Because the mode of exposure in these industrial workers is through the respiratory system or skin, for a given blood level to be reached, the concentrations in the respiratory system and skin are much higher in these workers compared to those who are exposed through artificial hip devices. And therefore it is understandable that respiratory problems, bronchial asthma, pharyngeal and lung cancers and dermatitis are found to be the risks in heavy metal workers. In patients with MoM exposure, Visuri has shown that the prevalence of respiratory diseases (Table1) and the incidence of lung cancer is significantly lower in patients with MoM hip replacements over a 30-year period. There is no difference in the incidence of cardiovascular problems in those with MoM hips as compared to those with metal on polyethylene replacements. The problems which are peculiar to high-wear MoM hips are local adverse effects more commonly than anything else. The concentrations of metal are highest in the local area around the artificial hip and therefore that is where the effects are seen. 8. Has anyone done a large study of artificial joint recipients that contain cobalt and lung diseases? In the response to question 5, Visuri’s work on the cause of death shows that the prevalence of respiratory diseases is reduced in patients with MoM hips. 9. What is considered normal levels for metal for a patient that has one implant? Two implants? Provided metal ion testing is conducted in a validated laboratory with instrumentation which gives reliable results, metal ion studies published so far appear to suggest that the average blood metal ion level in a group of patients with a well-functioning BHR are around 1 to 2 parts per billion. Patient to patient variation can occur from time to time. A single reading between 5 and 10 ppb of cobalt should not cause alarm. Persistently high levels would increase the possibility of local debris-related damage to bone and soft tissue structures; and the literature shows that extremely high levels (above 50 ppb) have the potential to cause systemic problems. However each patient’s individual response to metal ion levels varies with the result that some patients with high levels may be totally asymptomatic while others with moderate elevations can develop problems. Patients with two implants have concomitantly higher blood levels. However the local metal debris levels around each joint is no different whether there is one or two implants. Since the more frequent problem with MoM bearings is local adverse reactions the higher blood levels do not affect the incidence of adverse reactions. 10. When should a patient get tested for metal levels after surgery and how often? Should they wait two years before the first test? Unlike the ASR, the BHR is more tolerant to minor surgical error. At the McMinn Centre we always Xray our patients while they are still in the Recovery Room to make sure that the cup abduction angle is close to 40 degrees and no more than 55 degrees under any circumstance. If Mr McMinn finds that the cup abduction is greater than 55 degrees he would not hesitate to take the patient back into the operating room to re-position the cup in an acceptable position. Within this reasonable range (with abduction angles less than 55 degrees) we found no correlation between BHR cup abduction and metal ion levels. This does not hold good for other designs which are not as tolerant to minor surgical error. We do not routinely perform metal ion tests in our patients at any stage unless they have been included in a clinical study. In order to see if there are any asymptomatic patients with high metal ions or hidden debris reactions we investigated all of the earliest BHRs performed at our Centre with metal ion testing and cross-sectional imaging when they were seen for their 10+ year follow-up. These patients had forgotten about their hips and had carried on with life as normal in the interim. Most of them did not have to come for any interim review after their 2-month follow-up nor have their metal ions assessed at any time in the interim. Among them we found none with the excessively high metal ions reported with some other devices. Provided the surgeon is satisfied that the BHR has been performed with reasonable accuracy we do not believe there is a need for routine metal ion testing unless the patient develops symptoms. These comments however apply to BHRs only. 11. Is it advisable to abstain from taking certain supplements that contain chromium or anything else? Most health supplements contain trivalent chromium which is the non-carcinogenic water soluble type. In a small unpublished trial in normal staff volunteers we found that the absorption from these supplements is miniscule. 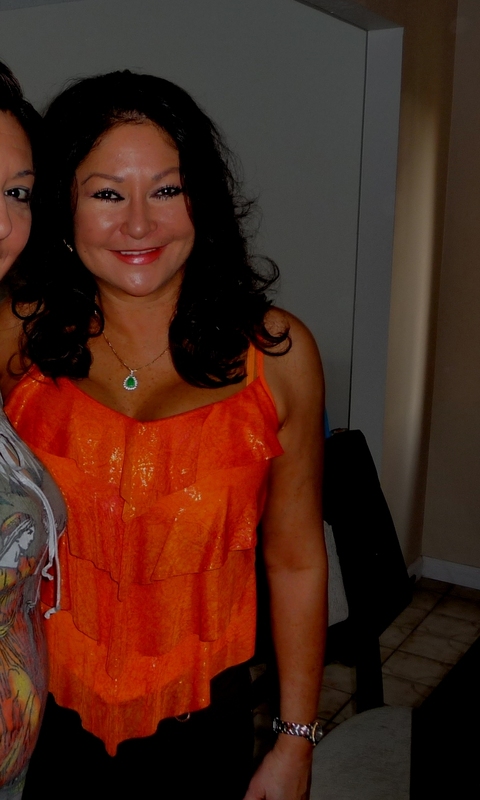 In the presence of a MoM hip there is an endogenous supply of this element in any case and therefore there is no need for dietary supplementation. If a person is having a metal ion assessment it is advisable to abstain from these trace metal containing supplements at least for a couple of weeks before the test in order to ensure test validity. 12. Has there ever been a study in regards to improper gait (possibly from other medical issues like feet, ankle, or knee problems) causing excessive wear on the metal on metal device? If not, what are their opinions? Sometimes knee, ankle and spinal problems develop secondary to (as a consequence of) the awkward position in which the hip stiffens in an arthritic state. Hip Resurfacing allows pain-free movement of the hip and frees up hip movements. This allows the spine, knee and ankle symptoms and the gait to improve. If in addition the patient suffers from knee arthritis, ankle arthritis etc the symptoms arising from them would have been made worse by the pain and restriction in an arthritic hip and therefore they too often find a degree of relief after hip resurfacing. However in due course they too may need corrective treatment. The aim of hip arthroplasty is to reconstruct the hip in such a way that its centre of rotation is positioned in the natural hip centre and the femoral head articulates with it in the most natural way with all parameters such as the length and offset restored and the muscles remaining neither too stretched nor too lax. Abnormalities elsewhere that put un- natural loading pattern on the hip can affect joint function and metal ion levels. A common associated problem we encounter is the presence of abnormal femoral anteversion. This can lead to edge loading and high metal ion levels unless taken into account during cup implantation. Likewise other knee and ankle problems can also lead to abnormal loading and high wear. 13. For those who do experience metal related problems is there a set of consistent symptoms or can it only be really diagnosed by actually going in and and examining the joint area? In other words, are there specific things people with metal implants should be looking for related to this problem so that they don’t wait “too long” before getting checked out? The 11 cases who needed a revision for a metal-debris related problems at our Centre (out of the more than 3300 BHRs) presented either with discomfort or pain in the hip or with progressively reducing ability to play sport or walk long distances or with a feeling of fullness in the groin, or with swelling of legs or ankle. In the occasional case, other surgeons have reported identifying patients on the basis of radiological signs alone in the absence of symptoms. 14. At one point, Mr McMinn had developed a ceramic on metal resurfacing system. Does he see this as being the direction that things will evolve in the future, or only as a substitute for those with metal sensitivities? It is close to impossible to improve on the 97% success at 14 years achieved in Mr McMinn’s series of all-comers (all patients at all ages and diagnoses and both genders included) with the BHR. There is currently no other hip replacement or resurfacing which even approaches that success rate in this genre of patients, a majority of whom are young and active. 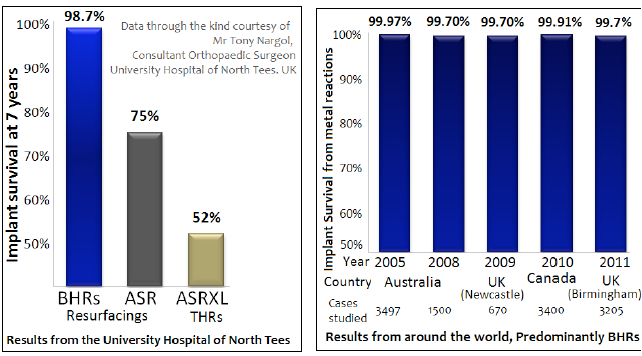 The 5, 10 and 14-year implant survivorship of BHR in Mr McMInn’s series are 99%, 98% and 97% respectively. This includes all patients with any diagnoses and revision of either the cup or the femoral component for any reason as the end-point. Those that have failed have been converted to a Total Hip Replacement which would have been the treatment in the first instance if resurfacing had not been available. Following revision all of them have returned to their normal lives. Young men with osteoarthritis are the highest risk group for implant failure with a conventional total hip replacement. Their high activity levels wear the hips out at a rate faster than what would happen in older retired patients. In the Swedish Hip Register the survivorship in this age group is 81% at 10 years and 33% at 16 years. 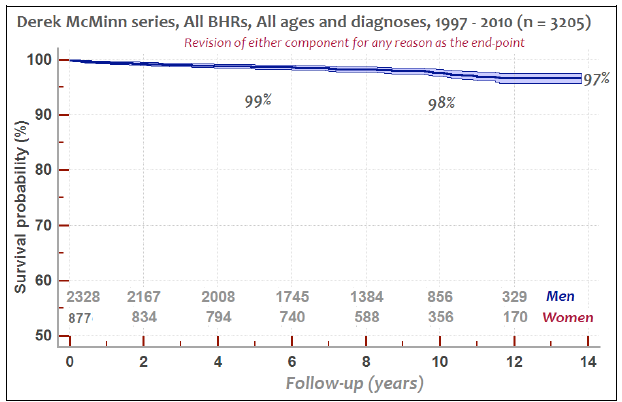 In this high risk group Mr. McMinn’s series of BHRs shows a 98.5% survivorship at 14 years. A very small percentage of patients (0.3%) from our BHR series have had adverse tissue reaction requiring revision. We have never carried out metal-on-metal joints in patients with a history of allergy to metal. We are however, getting increasing numbers of patients who wish for a conservative hip arthroplasty but have a history of allergy to metal and are shown to be Lymphocyte Transformation test positive to nickel. Only in such patients with known allergy, Mr McMinn uses a ceramic on metal BMHR (Birmingham Mid-Head Resection device) and we find the metal ion levels in these patients extremely low. Our numbers and long-term experience with this device are limited but in the absence of a better alternative this is currently the only conservative option for patients with a known allergy. A Birmingham Mid Head Resection femoral component can be used with a ceramic head. Hip simulator testing showed that the wear from a CoM bearing is much lower than the wear from a standard metal-on-metal bearing The BMHR stem was originally developed for use in patients with poor quality bone in the femoral head. These patients with severe cystic change in the femoral head or with osteonecrosis (dead bone in the femoral head) are not ideal candidates for hip resurfacing. In such patients the BMHR has been giving excellent results because it allows the poor quality bone to be removed and the stem rests on good bone. In patients with metal allergy the BMHR stem is proving to be very useful because it allows the use of a ceramic ball which against the same metal cup as a BHR. The x-ray to the right shows a BMHR fitted with a ceramic head. 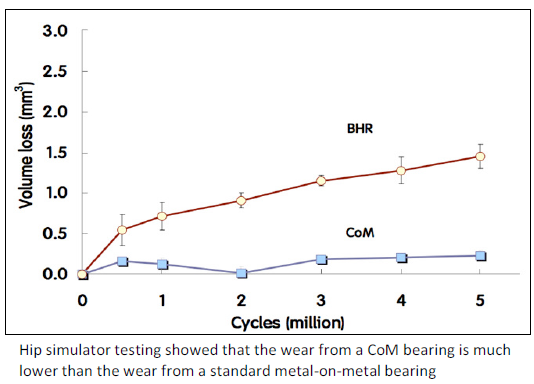 Laboratory testing of the ceramic on metal (CoM) bearings in a hip simulator has shown that the wear is phenomenally lower than the wear from a regular BHR. Eighteen patients have so far received the CoM BMHR and in every case it was because the patient was not suitable for a metal-on-metal bearing. The metal ion release in these patients confirms the hip simulator finding and their urine and blood levels of cobalt are considerably lower than the levels seen in patients with BHRs. 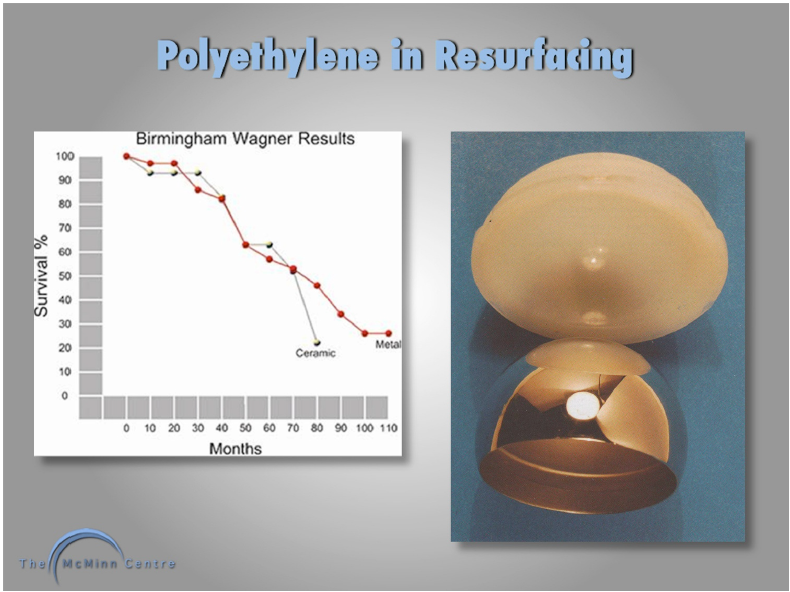 Many patients ask why polyethylene cannot be used as part of the bearing surface in hip resurfacing. Patients rightly point out that the commonest bearing couple for hip replacements is metal on cross-linked polyethylene. Conventional polyethylene was used in the bearing couple of hip resurfacings during the 1970s and 1980s. In Birmingham the Wagner metal-on-polyethylene and ceramic-on-polyethylene resurfacing was used. 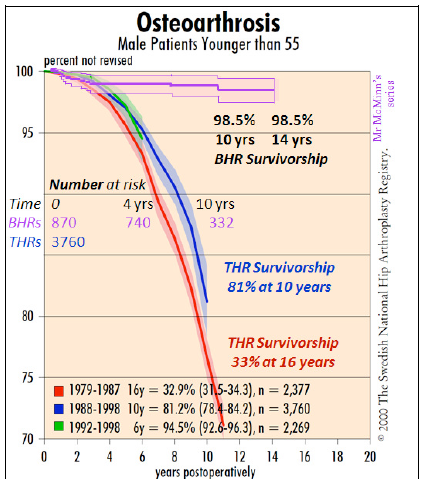 The survivorship graph below shows unacceptable results with a 50% revision rate at 6 years. The problem with conventional polyethylene is that the larger the femoral head, the larger the volume of wear debris of polyethylene generated. This polyethylene debris led to acetabular osteolysis, femoral head osteolysis and component loosening. The unacceptable results of conventional polyethylene hip resurfacing can therefore be explained. The graph on the left below shows that on laboratory hip simulator, the bigger the femoral head, the greater the wear volume of polyethylene generated. This is however only the case with conventional polyethylene. The graph on the right below shows that when using cross-linked polyethylene, wear volume is independent of femoral head size. This means from a purely wear perspective, cross-linked polyethylene is perfectly suitable for the large femoral heads, inevitable with the use of hip resurfacing. The big problem with cross-linked polyethylene however, is that the radiation cross-linking and re-melting which is used to eliminate free radicals and minimize oxidative attack both result in weakening of the polyethylene. This can be seen in graph below, left. The left bar represents the strength of conventional polyethylene, the middle bar represents the strength of cross-linked polyethylene using 100 kiloGray of radiation, the right bar represents the mechanical strength of the cross-linked polyethylene following re-melting, and elimination of free radicals. The right hand picture below shows retrieved components from a failed total hip replacement. The cup had been inserted with high inclination and the thin cross-linked polyethylene has fractured. It is not considered to be a viable safe proposition to use a monolithic cross-linked polyethylene insert for hip resurfacing. Hip resurfacing has to utilize thin prosthetic component layers in order to resurface both the femoral head and the acetabulum, yet remain conservative from a bone-stock perspective on both the femoral head and acetabulum. This effectively means that the wall thickness of the acetabular component has to be 3mm. 3mm happens to be the thickness of the acetabular wall of the BHR and this gives an out-diameter to inner-diameter (OD-ID) difference of 6mm. 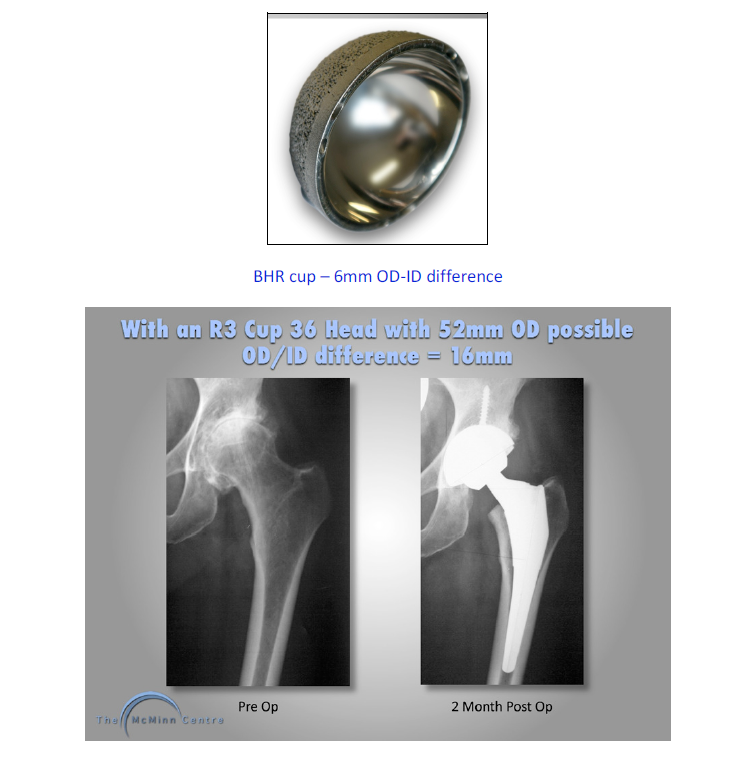 It can clearly be seen that the minimum OD-ID difference of 16mm with a total hip replacement using a titanium acetabular shell and a cross-linked polyethylene liner is quite different to the to the 6mm OD-ID difference using the BHR. Mr McMinn has been working with polymer chemists and engineering colleagues over the past 2 years to try and manufacture a resurfacing cup with a metal shell and a cross-linked polyethylene liner. Due to advances in modern direct compression molding, it is now possible to only cross-link the wear zone of the component used for articulation. This gives wear resistance in the wear zone and strength in other areas of the polyethylene liner. This is depicted in the diagram on the bottom-left and on the bottom-right red dye is used to visualize the cross-linked polyethylene in the wear zone. 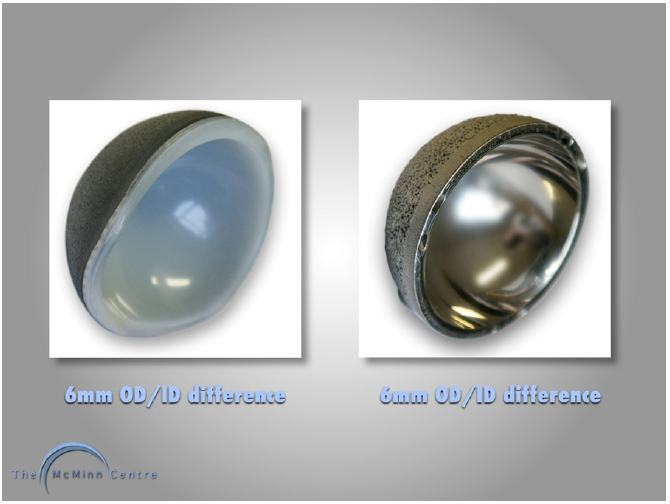 The new polyethylene cup is shown in the picture (below-left) and this has exactly the same OD-ID difference as the BHR. This device has now been manufactured and is currently undergoing extensive laboratory testing prior to planned clinical use. Over the last couple of years we have been measuring metal ion levels in the earliest patients who had undergone a BHR during 1997-98, and were returning for their routine 10+ year review. With a one-sided BHR out of 115 patients there were only two who had a blood cobalt level above 7 ppb. We investigated them with an array of investigations including other blood tests and multi-slice metal artefact reduction scans and neither of these had any local or systemic adverse reaction. 16. If someone is allergic to certain metal jewelry what are the chances of having a deep tissue allergy? What is the most accurate way of testing someone for a deep tissue allergy? It is estimated that approximately 10% of the population shows skin (cutaneous) allergy to metal products like costume jewellery. In terms of deep tissue allergy the leading authorities agree that, ‘clinically important metal hypersensitivity in patients with metal-on-metal bearings appears to be low’. In our series only 0.3% of patients required a revision for presumed metal debris reaction. It is not clear if these cases represent a true allergic response or an expected response to excess debris. There is no proven way of testing for deep tissue allergy. Cutaneous testing works through a different mechanism to deep tissue allergy, and therefore is not of much benefit. Lymphocyte transformation testing is described as one of the ways of testing potential deep tissue allergy but is not proven. 17. What is the difference between a MOM THR and a ceramic THR? If someone is allergic would ceramic be the best or only choice for them. Is there still some metal in a ceramic THR? MOM and ceramic relate to bearing (articulating, rubbing) surfaces. MOM is a metal surface articulating with another metal surface. Likewise ceramic on ceramic is also self explanatory. Both ceramic and metal can also be used against conventional polyethylene or cross-linked polyethylene and ceramic can be used against metal. A metal surface can be treated in a way to make it bone-friendly and allow bone to grow on to it, thus eliminating the need for an intermediate substance, a filler like bone cement or a metal carriage. Neither polyethylene nor ceramic fix to bone and therefore need either a carriage or a filler (bone cement) or both. On the femoral side the stem is always made of metal since neither polyethylene nor ceramics are stem materials. Ceramic and polyethylene cups often use a metal shell for fixation. Therefore every hip and knee replacement always has some metal in it, whatever the bearing surface is made of. Furthermore, where the ceramic or the plastic fixes to the metal stem, there is always an interface with the potential for wear and corrosion like the metal bearing surfaces. All modern hip replacements have one or more junctional cones. Micromovement and fretting corrosion at this interface occurs in every type of hip replacement MoM, Metal-on- polyethylene and ceramic on ceramic, leading to metal ion release. Ceramics are brittle materials and as such are subject to fracture in use. The most modern ceramic is called Delta ceramic and this has strontium and chromium added to increase toughness and hardness. Despite this advance in ceramic manufacture, when used as a ceramic-on-ceramic couple for total hip replacement, the acetabular ceramic liner is still prone to fracture. This is best shown in a published IDE study from the US. A majority of those who are allergic to metal show allergy to nickel. If a patient reports allergy to costume jewellery etc we send their blood sample for metal allergy assessment before their operation. If it is found that they are indeed allergic to one of the metals contained in the alloy then it is unwise to perform an MoM bearing joint. A THR using a ceramic head and a cross-linked polyethylene cup is the ideal option in these cases. Ceramic on metal BMHR is preferred as a conservative option, if the patient is very young and/or active. 18. How does the metal impact the body’s immune system? Naturally, metal does not exist in the body in nature. The view that normally metal does not exist in the body is incorrect. See response to question 5 above. The interaction between metals and immune system is variable and not fully understood. Metals participate in immune reactions and therefore, in theory, immune-suppression and activation are potential effects. Local debris-induced immune mediated responses are responsible for failure in high wear bearings. However we have not come across any significant systemic immune reactions in patients with BHR bearings and to our knowledge no large series has described such systemic disorders.